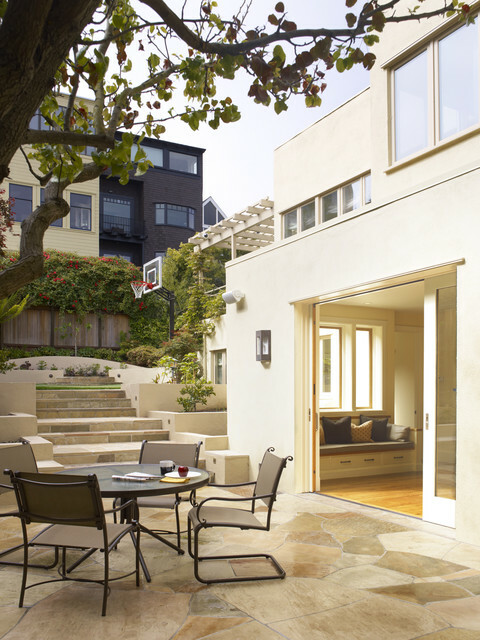 Complete remodel of a historical Presidio Heights pueblo revival home—originally designed by Charles Whittlesey in 1908. Exterior façade was reskinned with historical colors but the original architectural details were left intact. Work included the excavation and expansion of the existing street level garage, seismic upgrades throughout, new interior stairs from the garage level, complete remodel of kitchen, baths, bedrooms, decks, gym, office, laundry, mudroom and the addition of two new skylights. New radiant flooring, electrical and plumbing installed throughout. who makes the dining table and chairs? sorry, the client purchased the patio furniture so I don't know the source.